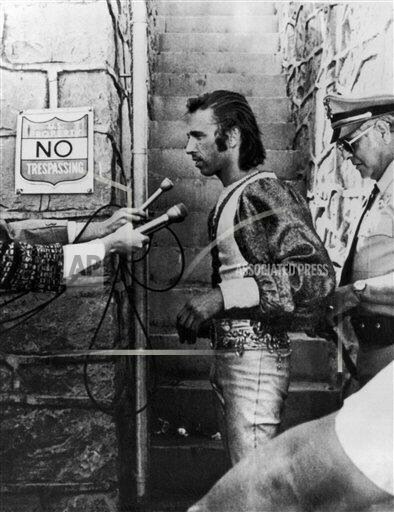 Steve McPeak - Dec. 1982, taken into custody after his three day stay on the cableway over Hoover Dam. Mr. Steve “Unique” McPeak is well known in the high wire and unicycle circles. His contribution to the history of Hoover dam is somewhat infamous at best. McPeak is gifted with uncanny balance and has performed daredevil feats throughout the world. He began his career as a unicyclist while attending Asbury College in the state of Washington, where he grew up. He became so good at this that he set a record for cycling the entire length of Route 66 on a 35 foot tall unicycle. This was accomplished in about six weeks. He later rode a unicycle across the cableway at Hoover Dam and up the cable leading to the Christ statue on Sugar Loaf Mountain in Rio de Janeiro. He is credited with riding the world’s tallest unicycle (almost 102 feet) in a stunt performed in Las Vegas. McPeak was a founding member of the Unicycle Society of America. Gaining fame as a unicyclist was just one facet of his career. Steve McPeak is certainly included among the best in the exclusive high wire community. He has walked the cables of the Golden Gate Bridge in San Franciso and the Vincent Thomas Bridge in Los Angeles, California, He worked at Circus Circus in Las Vegas, Nevada, and with various other circus groups. McPeak also worked with the world famous Wallendas. There are four recorded instances of McPeak’s assault on the Hoover Dam. His stunts were enabled by the fact that the historic “Government Cableway” still spans the Colorado River to allow for movement of heavy equipment to the powerhouses below. These cables are anywhere from 800 to 1000 feet above the river. He seemed to have a knack for eluding security and sneaking out on these cables In November 1975 he rode a unicycle across the river. 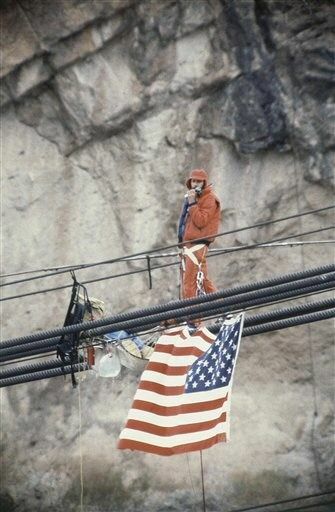 In February 1976 he not only performed his high wire act on the cables, but remained on the cable system for three days in an attempt to make a record for the longest stay. This was followed in 1983 by a three day two night stint on the cables to protest a one billion dollar aid package that President Ronald Reagan was considering for Brazil. McPeak felt that we should spend such resources on the poor and disenfranchised in the United States first, before sending money abroad. He intended to stay aloft on the cable in his sleeping bag for at least three days and up to three weeks, abandoning the cables if he received a call from President Reagan. The call never came. However, cold winds and rain forced him to give up the protest. A last known assault on the cableway was a few months later in February 1983, when he high wired his way out on the cable system with his fiancé on his shoulders. They were later married on the cable 800 feet above the river, and spent their honeymoon in a sleeping bag attached to the cable. McPeak’s efforts did not go unnoticed or unpunished. Each time that he went out on the cable system and enthusiastic crowd of supporters and visitors to the dam cheered him on. Each time he was arrested on returning to land, charged in Federal Court, and fined and released. His acts were basically a nuisance for the Hoover Dam security service. They had a policy of not attempting to pull him off the cable in order to avoid the possibility of making him accidentally fall. However, he was greeted with handcuffs each time that he did return to the cable platform. Since the McPeak era, no one has attempted to cross the cables traversing the river near the downstream face of the dam. With the heightened security at the dam since 9/11, it is unlikely that this feat will ever be repeated unless it is with the consent of the Bureau of Reclamation. Pedestrians are not now allowed on the dam after dark and all vehicles must pass through a secure checkpoint. The Bureau does not wish to encourage other opportunists and does not mention McPeak in any of its information formats.